the worst of the lot was Hot Stuff the Little Devil, who was no less than a demon from Hell. 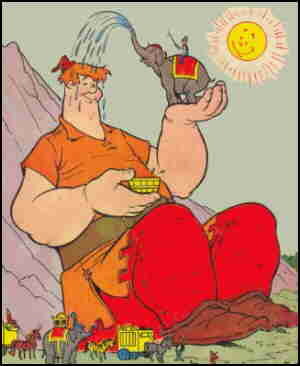 Stumbo the Giant, who occupied the back pages of Hot Stuff's comic book, was kind of a peripheral part of that line, but considering how giants generally behave in folklore, still a part. Stumbo made his first appearance in Hot Stuff #2 (December, 1957), in a story whose writer is unknown, but which was drawn by Warren Kremer (Planet Terry, Royal Roy). Also introduced in that story was nearby Tinytown, whose human-sized residents (such as Mr. Thatch (no relation), Officer O'Floodle, and Doc Sawbones) formed his supporting cast. He was said to have originally come from Giantland, but others from that locale were seldom if ever seen. Stumbo generally got along well with his pint-size companions, despite the fact that his ham-handed attempts to help them out (he wasn't very bright) often brought on disaster. An exception was Dr. Cesspool, who frequently attempted to do away with Tinytown's humongous protector, so he could rule. Many of Harvey's 1950s back-up features, starting with Little Dot in 1953 and continuing with Little Lotta in 1955, Richie Rich in 1960 and more, quickly moved out into regular titles of their own. Stumbo was tried out for his own comic in Harvey Hits, that publisher's answer to DC's Showcase, starting in #49 (October, 1961). He appeared in nine more issues of that title, the last dated January, 1965, but never did have a regular comic of his own. He did, however, befitting his size, headline an extra-large quarterly, Stumbo Tinytown, for 13 issues, October 1963 through November 1966. He also, unlike the average Harvey character, didn't get into animated cartoons. But he did hang around the back pages for a long time, disappearing only when the publisher itself went on hiatus, in the 1980s. In the '90s, when Harvey Comics briefly came back, Stumbo came back too, in his usual position as Hot Stuff's back-up feature. The Harvey characters occasionally flicker in and out of print, even to this day. Stumbo is usually seen with them, but never as one of their real stars. Text ©2006-09 Donald D. Markstein. Art © Harvey Entertainment.